I’ve tuned down the humour for this article. It’s genuinely something to ponder about. 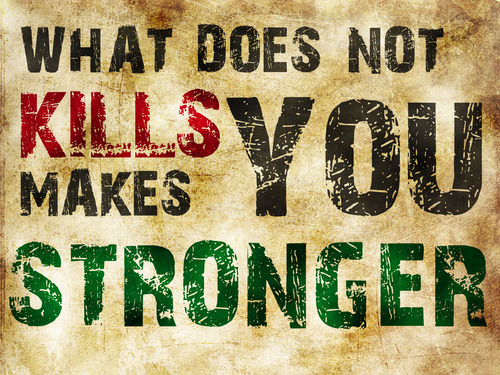 “What doesn’t kill you, make you stronger” is a phrase that has always been rather popular with the unwashed masses. Heck, It’s a pretty darn good saying an’ all, don’t-cha think? …. Don’t-chaaa? Commonly used to raise one’s spirit, usually a lie told to yourself to make you feel like you are stronger than you actually are. Is there anything wrong with that? Of course not… We all need to tell ourselves a little white lie once in a while so we feel comfortably satisfied with what has just happened or to help us come to terms with such and such.